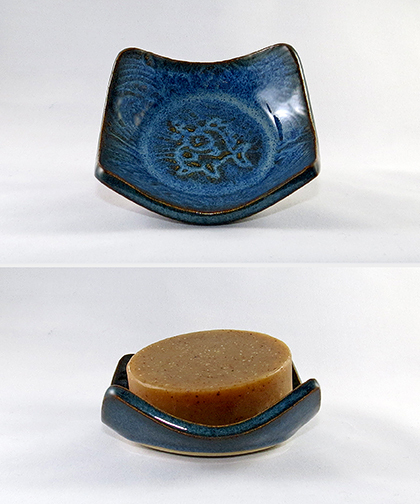 This is a ceramic pottery soap dish made especially for us by a Seagrove NC potter. The dish is approximately 4 inches square. Note that the color will vary from dish to dish making each dish uniquely different. Note that dish will vary from the photo. We do welcome e-mails to question what colors we have available. Our Soap Dishes are made of ceramic and sourced from Seagrove, NC. They compliment our soaps as they are formed when soft around a spherical mold. This creates a dish that is turned up on the four corners, slightly lifting up the soap and allowing it to properly drain and dry. A soap dish is a necessity to insure that soaps will last a long time. Place soap in dish to drain and dry. Remember to keep excess water out of the bottom of the dish.